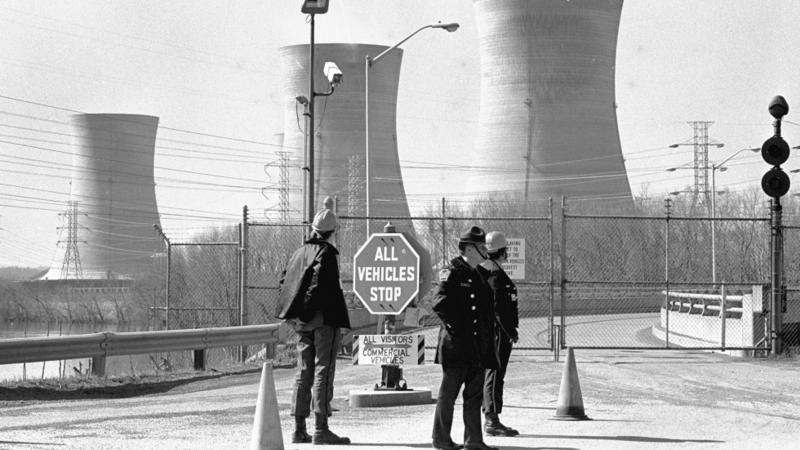 Lessons Learned From Three Mile Island's Meltdown Monday is the anniversary of the worst nuclear accident in U.S. history. The partial core meltdown at Three Mile Island on March 28, 1979, was a major setback for nuclear power in the U.S. But the industry did learn some crucial lessons about safety and crisis management from the accident. A Pennsylvania state trooper and plant security guards stand outside the closed front gate to the Metropolitan Edison nuclear power plant on Three Mile Island near Harrisburg, Pa., in 1979. As engineers in Japan struggle to bring crippled nuclear reactors under control, Americans are marking the anniversary of the worst nuclear accident in U.S. history. The partial core meltdown at Three Mile Island on March 28, 1979, was a major setback for nuclear power in the U.S. But the industry did learn some crucial lessons about safety and crisis management from the accident. It was nothing as dramatic as an earthquake or tsunami that triggered the accident at Three Mile Island Nuclear Generating Station, about 10 miles south of Harrisburg, Pa.
"A valve stuck open," says Sam Walker, a former historian with the Nuclear Regulatory Commission. "A valve didn't close as it was supposed to and coolant ran out of the core." "It was a minor breakdown that was compounded by operator error," says Walker, who is also the author of a book about the accident. "What they could see was that something was wrong. And they could see it because alarms were sounding, lights were flashing, it was clear that something was wrong. But it wasn't clear exactly what was wrong." That confusion extended beyond the control room. At first, Metropolitan Edison, the utility that operated the plant, insisted this was a minor accident with no release of harmful radioactivity. But by the afternoon, Lt. Gov. Bill Scranton was telling reporters that wasn't exactly true: "The situation is more complex than the company first led us to believe. There has been a release of radioactivity into the environment." When the crisis ended five days later, relatively small amounts of radiation had escaped from the plant. No one had been injured. But the accident had a huge impact on the industry. Not a single U.S. nuclear plant has been ordered and built in the 32 years since the accident. The accident, however, did lead to tougher safety standards for nuclear plants. "The most important changes were what were called human factors," Walker says. "That was the lesson that was most obvious was one, you had to improve operator training. You had to give the operators the knowledge and the tools they needed to be able to deal with a situation like they faced on the morning of March 28, 1979." Today every nuclear power plant is required to build a replica of its control room for training purposes. "It's real," says Ralph DeSantis, communication manager at Three Mile Island. "It's as real as it can be. Like a cockpit simulator for airline pilots, the training is very realistic." While Unit 2 has been shuttered since the accident, Unit 1 reopened in the mid 1980s under new management. DeSantis says better training is only one lesson the industry learned from the accident. "We're very open in saying that at the time of the accident, the utility here at TMI did a bad job of communicating to the public about what was going on, and that led to some of the fear that existed," DeSantis says. But for some, that fear never went away. "It's a real time system and I'll show you how it works," says Eric Epstein, who has turned the basement of his Harrisburg house into a monitoring station. He collects independent readings of radiation levels around Three Mile Island. Epstein doesn't trust the plant's operators or the government to share sensitive information in a crisis. "When you're living through a nuclear accident and don't know what the outcome is going to be, that's a nightmare you never wake up from. So you know those are shadows that chase you forever," Epstein says. Those shadows are still chasing the U.S. nuclear industry, too. Polls show that Americans are divided over whether to build more nuclear power plants. And that was before the disaster in Japan.